Miller in his Studio via SKYPE. Roger Miller has taught guitar lessons out of his home for years. He has now added SKYPE guitar lessons to the mix. Many people do this, why not Mr. Miller? Now he can teach all over the world (does the International Space Station have Skype?). He was initially skeptical that Skype lessons would be satisfying, but experience has not born this out. He is happily able to say that they have gone very well for everyone involved. One of his lessons lives in Tokyo – he’s drinking his morning coffee while Miller shifts to beer in the evening. “Mr. Miller can summon up three decades of guitar sounds.” N.Y.Times (written in 1983). “One of the Thirty Down and Dirty Guitar players of All Time.” Guitar Player Magazine. To hear what Miller is currently up to on the guitar, check out his new rock trio, Trinary System, is HERE. Weekly basis or a one-time session to open potential. Many people choose “every other week”. 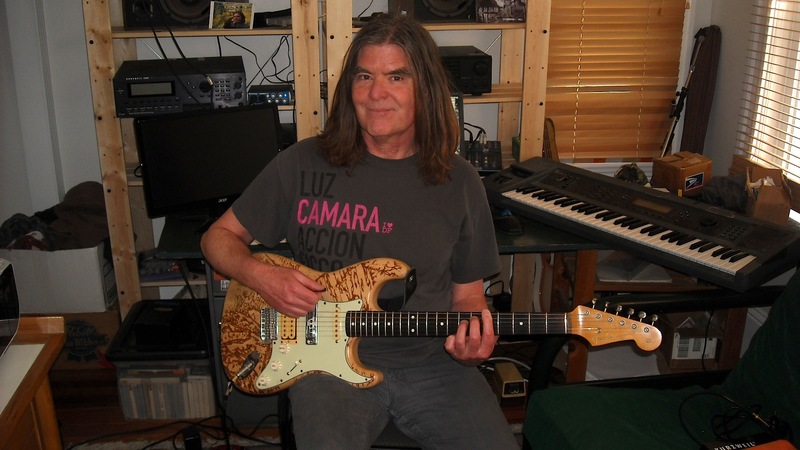 While most of Miller’s notoriety stems from the post-punk era, he studied composition at California Institute of the Arts and on occasion enjoys playing blues. He has played piano since he was 6 years old. He has been teaching guitar for many years. He began playing guitar in 1965. Lessons will be via Skype unless you can come to southern Vermont! I am available 11am-8pm EST, though my other schedules (soundtrack work, rehearsals, touring, other lessons) modify that time frame each week. In other words, tell me what time you’d like, and I’ll try to make that happen. Lessons can be weekly, bi-weekly, only once, or sporadically – I try to fit your needs and interests. Lead work, chording, effects, song writing, unorthodox sound production – whatever your interest I will bring my experience to bear on it. My primary goal is to make your playing better, where your interests are. I suggest have a notebook handy to jot down notes and ideas. Please pay when you schedule a lesson. I am interested in taking lessons. Hi Ryan. If you do Skype, that can happen. If you live near southern Vermont, it can happen to. Are you actually interested in taking lessons? Yes, I am very interested. I live in Greenfield. I am available 11am-7pm, though my other schedules (soundtrack work, rehearsals, touring, other lessons) modify that time frame each week. In other words, tell me what time you’d like, and I’ll try to make that happen. Lessons can be weekly, bi-weekly, only once, or sporadically – I try to fit your needs and interests. Lead work, chording, effects, song writing, unorthodox sound production – whatever your interest I will bring my experience to bear on it. I use a “POD” amp modeler through my home stereo. I have only one guitar here, a ’60’s Japanese Strat Reissue. I suggest you bring your guitar so we can see what makes it, and you, tick. If it makes sense, bring the effects you use so that we can see how sounds interact. Also, I suggest bringing a notebook to jot down notes and ideas. I teach out of my home in Guilford, VT, just over the border from MA, half-way to Brattleboro. If you want specific directions, I am happy to give them. Sounds good! I am free in the mornings starting 11am most week-days. Weekends are trickier because that’s when most shows happen and I’m often out of town. Sure. I am around “most of the time” until early Oct. Mon. is a good day for me – I’m usually home and no gigs. Hi – my wife bought me a lesson for Christmas but I have no clue of how to book it or make it happen. Any follow up would be great. Thanks!